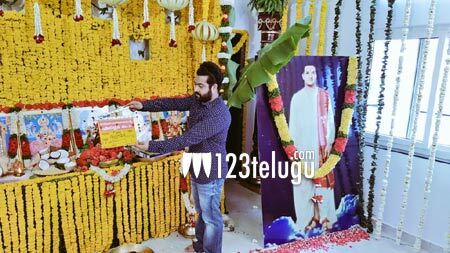 The much-awaited 27th movie of Young Tiger NTR has been launched this morning at NTR Arts office. NTR himself gave the first clap, while director VV Vinayak handed over the film’s script to director Bobby. Nandamuri brothers Harikrishna and Ramakrishna graced the puja ceremony. The film’s regular shooting will kick-start from the 15th of this month. Tentatively titled Jai Lavakusa, this movie will feature NTR in three different roles for the first time in his career. The movie stars Raashi Khanna as one of the heroines and Nivetha Thomas is the frontrunner to grab the other female lead’s role. NTR27 features highly talented technical team with CK Muraleedharan cranking the camera, DSP scoring the music and Hollywood wizard Vance Hartwell doing the special make-up. NTR’s brother Kalyanram produces this movie, which is going to hit the screens on August 11th.